This one could be subtitled - Silk blouse: The practice version. Not really a muslin, with this very lovely fabric, but more of a practice version for a solid color silk charmeuse in a rich teal green that I really want to get just right. 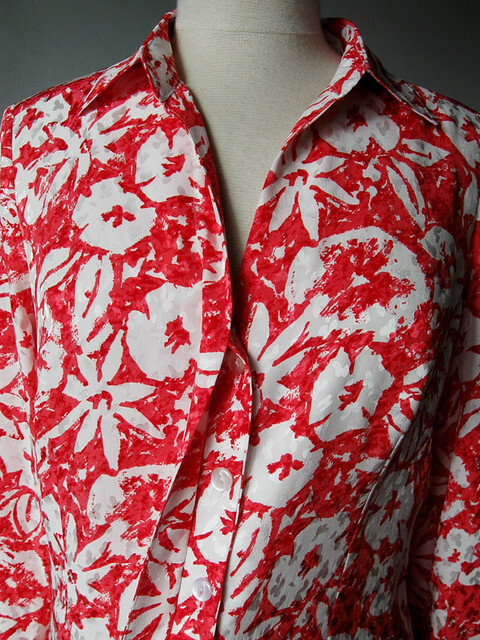 So I have completed a luscious silk blouse that very much says spring. 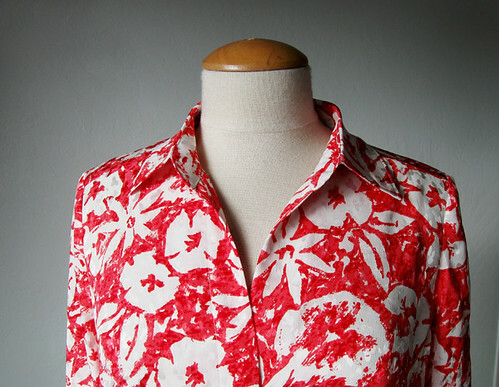 While there are a few daffodils just about to bloom - spring is not yet here so it will go into the wardrobe until the season is right for a white and coral print. Also the question of what to wear it with. I showed it to my friend Alice and she immediately said "white jeans!" Which is perfectly fine if you are 5'8" but I don't quite know about that look on me. More on white jeans later in the post. Back to the shirt. I made almost the same version of this a while ago - scrolling though my old posts it was 2011. That long! In silk and with hidden buttonholes. However I was never 100% happy with how that turned out. Even though I wear it a lot and it goes so well with other items in my repertoire. Since then I have made this pattern 6 times (one of those is hot off the sewing machine last night). But for the upcoming teal silk I wanted to do a little fit adjustment, thus a slight rework of the pattern and a test using this busy silk print. As for fit adjustments, in previous versions I wasn't happy with where the bust dart landed. I think one version was too low and another too high. For this version I adjusted it a bit - lower by 1/2 inch I think and it came out perfectly. In other versions I have converted the bust dart to shoulder gathers, and in a knit version I converted the bust dart to easing it into the side seam which works quite well in a knit. I will include links below to all the various versions. This picture was taken around 5pm on a very dark and rainy day, so just a quick dash outside. But rainy does not equal gloomy - not around here. Things are green and growing. We are SO hoping that the drought will be a thing of the past, but a few rainy months will not fix our water problems by a long stretch. (Don't get me started on water management in my state - such a big population, huge agriculture industry and total disregard for this serious issue on so many fronts, such as changing our mindset on usage for landscaping or lack of infrastructure to capture the rainfall. Anyway - all rainstorms are welcome now. Fit, not bad, right? Although I think it is too long and I am pondering shortening by just an inch or so, however I will wait until I figure out what to wear it with. A few construction details. I have a burgundy color silk charmeuse blouse that I bought at Ann Taylor about 10? years ago which I really love and that is where I saw this type of hidden buttonhole placket. 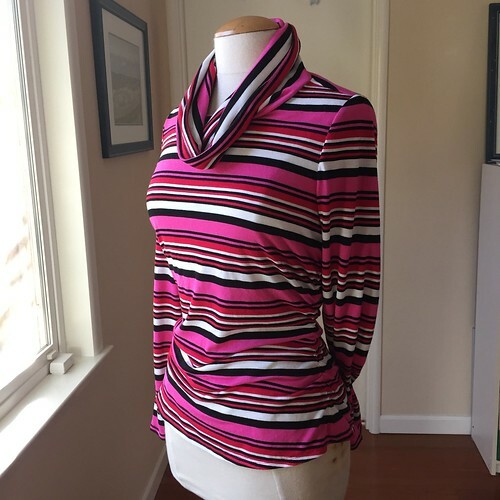 As it was hanging in my sewing room I noticed that it had a subtle angle above the upper button, such that the neckband actually didn't meet but finished about an inch apart. Does that make sense? See how the center fronts overlap and then don't quite at the top of the center front? That is the subtle angle. It also required taking length out of the collar stand and collar. It's a nice effect for a blouse that you are never going to button at the neck but I am not sure I would bother again. 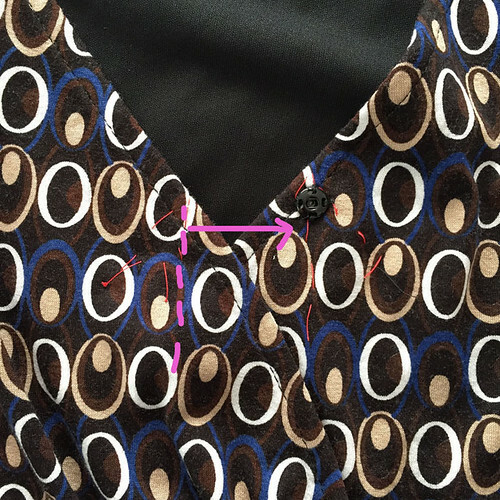 After I make the teal green silk blouse I will do a post on how to create the hidden buttonhole placket, as I was sewing and taking these photos I realized it is a bit hard to see with this busy print. Here's a look at the buttonhole placket, it is all finished and just ready to be flipped over and then stitched down. 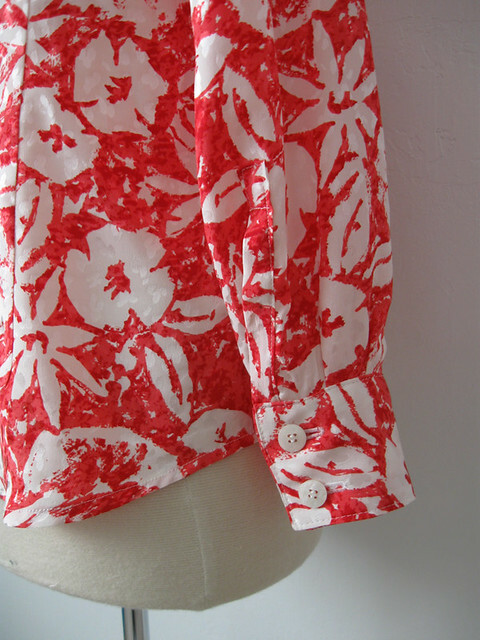 The buttonholes are done, and then they end up behind the actual front of the blouse, and are connected to the front facing. The whole thing is basically a 4-layer sandwich and you just have to keep track of where each layer is, and then also place it on the blouse front in the right spot so the buttonholes close across the bust etc. Also I used my favorite edge technique, which used to get so much traffic to my blog (now eclipsed by my "how I hem sleeves" post which is my most pinned post) What is a popular post is something I find interesting/entertaining and if I knew those posts would be read so much I would have done a better job with nicer photos! oh well. A better look at that clean edged facing. Basically you stitch it together, right side of fabric to right side of interfacing, then trim the seam and clip curves as need, then flip and press, taking care to get a crisp edge. For a change I did french seams on the side seams as well as the sleeves, but used the serger on the armhole. I am not at all a purist when it comes to seam finishing - in fact rather lazy about it. One of these days in a Random Threads post I will have to ramble on with my thoughts about the inside of garments. And viola, hidden buttonhole placket! I am also on a roll with finding buttons in my button box. People have given me so many buttons in the last few years. Anyone who cleans out their relative's home seems to want to present me with one of those old cookie tins filled with buttons or other sewing room paraphernalia so it seems silly to go out and buy new buttons. Plus the pleasure of finding a matching set is well, unmatched! That's the latest on my sort of test version. And I bought this fabric a couple of months ago at the local ASG stash sale for around $6. Score! Plus I have about 1.3 yards left which is just enough to make a sleeveless top. Which I have a feeling I would actually wear more often. Similar to this top which was also derived from this same Simplicity pattern. The pattern that just keeps on giving. Shirts made from this same Simplicity pattern. And I haven't even mentioned the placket on most of the other versions, I have never used the original sewn on buttonhole placket, I should show you how I make the all in one placket that looks like the sewn-on. and a cotton plaid version just finished and soon to be posted. Ok that's 7. Talk about value - for a Simplicity Amazing Fit pattern I bought for $ 0.99. Even at the regular price it would now be a bargain. anyway - Burda envelope patterns are starting to show up in their sale ads for $ 2.49 which is fantastic. So I did buy a few this week. the one on the left tickled my color block obsession, and I am trying to find some interesting yet casual fabrics so I could wear it jeans, maybe some kind of denim and knit combo - maybe including the leather waist element. The one on the right, I have had a hankering (is that a funny American word to some readers - meaning a craving, desire, itch, yen for something) anyway a thought to make a shawl collar blazer. Sort of easier than a standard lapel. But sometimes I think it looks a bit plain or frumpy. Bought the pattern anway. And the blouse on the left, looks quite nice for a floaty summer top. 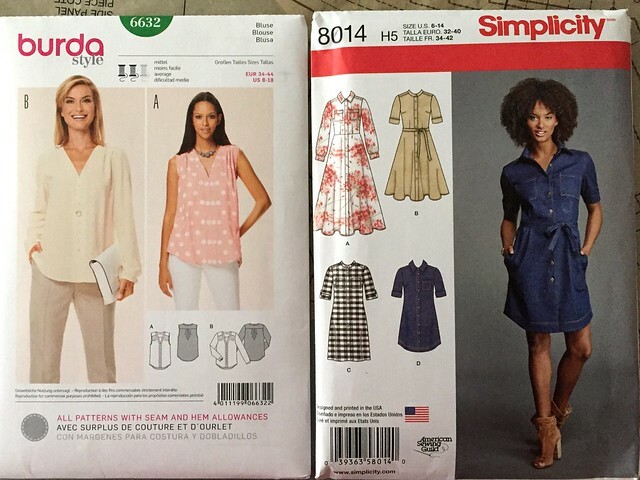 The Simplicity on the right, as soon as I saw that pattern envelope I wanted that exact denim dress. I think we will see a lot of those once the winter retreats. So that's the latest. For this weekend's sewing I might do some pattern experimentation - play around with some that have been in my stack of interesting possibilities. And otherwise enjoy the rain on the roof! oh ya, what about the white jeans? they look great in the summer but I always feel like they get dirty the minute I put them on, I am sure to spill some coffee or even something like an ink pen or a lipstick becomes a hazard in my hands. but I might give them a try. Random Threads # 17, What is up with that? Well that is kind of a random title, "What is up with that?" But I keep a piece of paper on my desk and as the weeks go by I jot down topics that are bouncing around in my head or I come across in my sewing web surfing. And the page for this edition of Random Threads had a bunch of nouns with the words "What is up with that?" scrawled next to them. I guess I am in a questioning mood. Randomly speaking of questioning - I happened to listen to a podcast where the author Gretchen Rubin was interviewed, she has a book out called "Better than Before" and her own podcast. Along with that there was a quiz you could take to determine your personality type (I defy you to resist those stupid quizzes when you are killing time or procrastinating) So as I was standing at the stove, sautéing some onions I tap, tap, tapped on my phone and determined that I am a questioner. Which I could have told them from the get-go. The point of knowing your personality type is to better able to understand motivations, do things that you want and generally be happier. At least that is what I gathered from the brief listen while dinner was cooking. I think I will give her podcast a try, who isn't trying to create new habits when the calendar turns over a new year? Also speaking of podcasts - I somehow came across a British podcast, Answer Me This. And have binged listened about a 1/3 of the episodes on iTunes, now pacing myself through the rest. So readers in the UK, are you a fan of this one? I find it hilarious. Silly, stupid, smart all rolled up in one. Let's talk new patterns. For the most part I am ho hum on the new pattern releases and if past history is any guide then in about 3-4 months (when the weather matches the pattern release) I will find a few Vogue patterns that I simply must have. But for now the latest release was interesting but no show-stoppers. 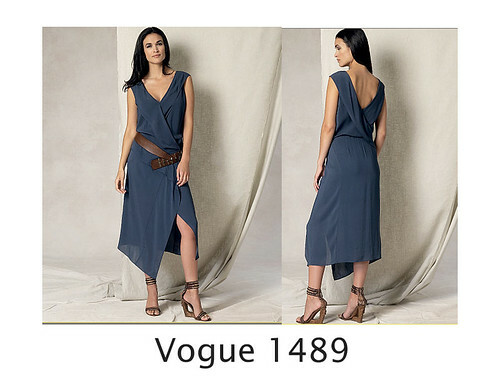 The one pattern that I really like is by my beloved Donna Karan for Vogue. However I fear it would be a doozy to alter to fit for my 5'3" frame. But I will probably give it a go when sleeveless dress weather is here. It RAINED today! yes we are getting storms, rain, wet weather. Hallelujah for us in drought stricken California. What does rain mean? weeds.......oh I am so fickle. Also looking more at that dress above I think it depends heavily on standing at that nonchalant/slightly fierce pose. Maybe in real life it would look like a droopy mess. But as I said, will probably give it a try. Simplicity Pattern website - WHAT is up with that? wow that is a mess. I cannot stand their website revamp or whatever the hell they have done with it. Tried to make it more e-commerce-y or Pinterest-y. So many websites revise and try to emulate the Pinterest look with lots of big photos that scroll past but then the actual utility has vanished. I typically went to their site to look for patterns, use the search functionality, and now the search is a jumbled mess. So bad. Makes me not want to bother with their brands which is kind of a shame. Sewing on TV: do you ever watch sewing shows on TV? Does anyone watch broadcast TV? Here in the bay area we happened to have quite a few PBS stations and they often show many different sewing shows. I received a new TiVo Bolt for Christmas (Oh, Tivo** how I love you and have for many many years - can I say I was an early adopter, I have one old Tivo with lifetime service that is more than 12 years old. which is kind of like a 20 year old dog. As we have had the hard drive croak on other Tivo units but that original one keeps on working. I probably just jinxed it by writing this). Back to my new Tivo: using keyword search for sewing - so many shows and so set up recording on them. Nancy Ziemen, Sew It All TV, Fit to Stitch with Peggy Sagers. Kind of surprising how many there are. Some are useless but others are interesting and every once in a while I have learned some fantastic tip that was really useful. I'm a big believer in taking in information from a lot of different sources, be it a book, podcast, blog, tv, video class. You just never know where the light bulb moment will be found. The Fold Line: a new community website for stitchers, with pattern reviews, forums, user profiles. I did sign up, looked around and have maybe been back once or twice. It seems like a good idea but perhaps not getting any traction? My impression is that people are too scattered to coalesce around a new site, so as much as sewers want a Ravelry for sewing, I don't think it has yet appeared. What do you think? I'm not really a participator when it comes to websites or forums. I do put up pattern reviews on Patternreview.com, because I get a lot out of the reviews of others and it seems only fair to contribute my reviews. But as for forums, discussion board etc. I don't see how anyone finds the time. Pantone Color(s) of the Year: in a word - blah. so weird. Yes, it is a marketing gimmick but these are really goofy. In fact separately they are OK but when you look at them together they each make the other seem more bland. Ok to be fair, unless the color is turquoise or maybe coral I will always think it is a little bland. Are you going to run out and find some Rose Quartz fabric? Please tell me no. Imminent demise of the Big 4 pattern companies? 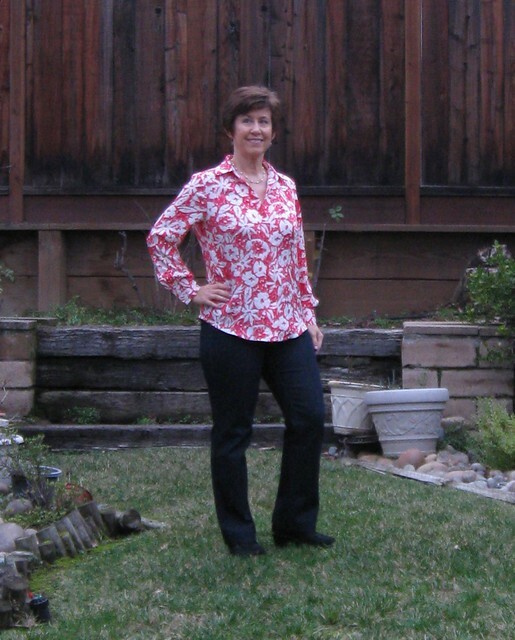 Did you read a blog post on SewMamaSew by Abby Glassenberg. She spoke about shifts in sewing industry trends. Most of it wasn't something I had an opinion one way or another, however she sort of predicted that the indie pattern share of sewing patterns will win out over the established traditional Big 4. I think she is out of her mind there. There is a market for certain independent patterns with the accompanying instructional tools and community, however my sense is that once you venture past beginning level or want to explore more complex garments, then the larger companies have the depth to product that product. Vogue, Burda, Marfy, these pattern companies by and large do a good job in producing patterns that a home sewer can use to recreate a runway look. I think her point of view is so far from garment sewing that the conclusions make no sense. 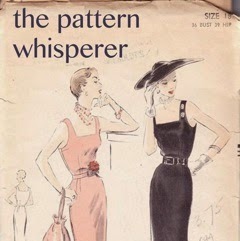 Also there have always been independent pattern companies. Businesses come and go, some last for decades and some go out of business, some are absorbed by larger entities. 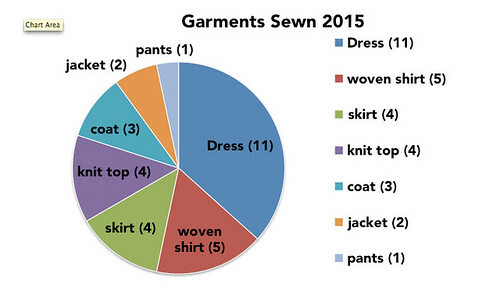 The sewing pattern industry is no different. A mystery to me: I love the look of this coat, Butterick 6244. Well actually, I love the the look of the coats made by these two. Lori of Girls in the Garden, her version here. It looks so stylish on her and color is such a great choice for a neutral go with anything coat. The other is Margo, who made it in red. Scrumptious. They are both perfection. But there is no lining! how does that work? Isn't it itchy? and I think it would stick to whatever you are wearing under. I will admire from afar but know those things would drive me crazy if I had it. Also both their versions are way better than the pattern envelope! Some sewing going on - as I might have mentioned I am trying to cut back for a while on sewing. With success, in that I have only made one item since Jan 1. Which is not this top, actually finished before Jan 1. It is a mostly McCalls 7046 t-shirt with the ruched sides, made smaller to fit better, and then the collar of the Sewaholic Renfrew top grafted on it (and adjusted to fit the neck opening. Super soft and cozy knit, in the fabric closet a good few years. Maybe Fabric.com? I used to buy from them but have not in several years. Anyway - I actually have a hot pink cashmere cardigan that matches exactly, which I had not worn in ages. But presto - cozy winter outfit. Hmm. what else is in that fabric closet? 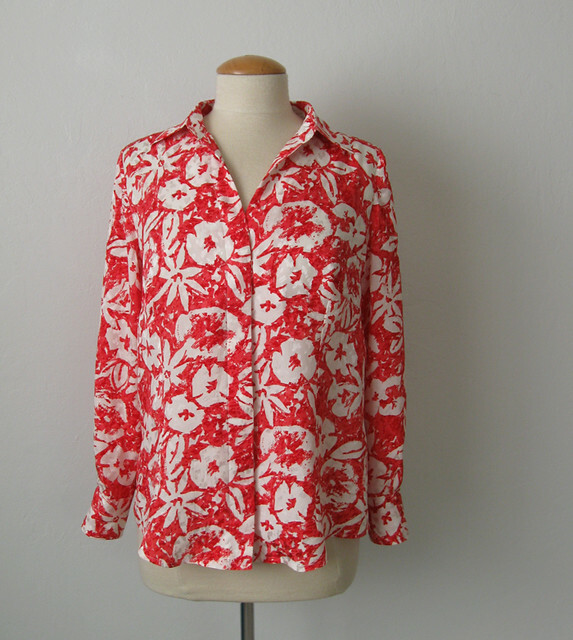 Sneak peek - just finished a silk blouse - I mentioned it has a hidden buttonhole placket which is something I developed (copied from a RTW blouse) so I will do a how-to post. It is surprisingly easy! ** TiVo - just in case, since I was blathering on about it and it is something you have never heard of. Do they have Tivo in Europe? Australia? not sure. It is maybe the original ? digital video recorder, basically a computer that records TV. What makes Tivo different is the interface - it is super easy to use, works really well, just a really well designed product that is often smarter than we are (ha ha) and now this new version Tivo Bolt is very tiny - like the size of a hardback book, and record/finds both broadcast and streaming. and you can watch on your computer in other rooms. Basically I will be able to stay in and sew until I run out of fabric. JOKING! Happy New Year! Thank you so much for all your nice comments on my year end wrap up, on my recent sewing output and most of all thank you for all the congratulations on my Pattern Review contest win. My sewing is always veering off in different directions, from churning out wardrobe basics to immersing myself in coat-making or tackling some difficult fabric. I have no idea where my mood will take me this year - it probably depends on what gems I find at some out of the way estate sale. Whichever way I go, I appreciate your readership along the way. Now that I have coat making out of the way - at least for this winter, I can return to something I finished in late November. This is Burda 6946 in rayon jersey. I bought the pattern a while ago, maybe in 2014 and had been meaning to use it for a dress for my friend Heather, and among her haul of fabric she purchased in NY last summer was this print. 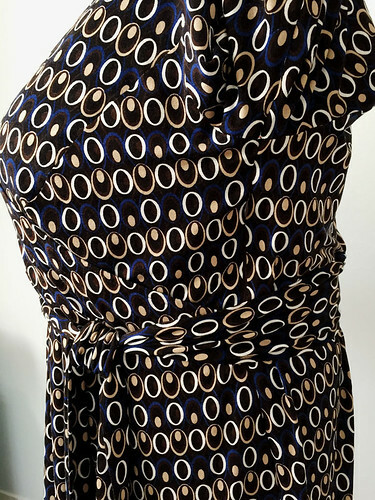 It is a very distinctive print so you probably can't see the lines of the pattern but it has some really interesting pattern pieces, and as one of the Burda Plus envelope patterns, was really easy to fit. 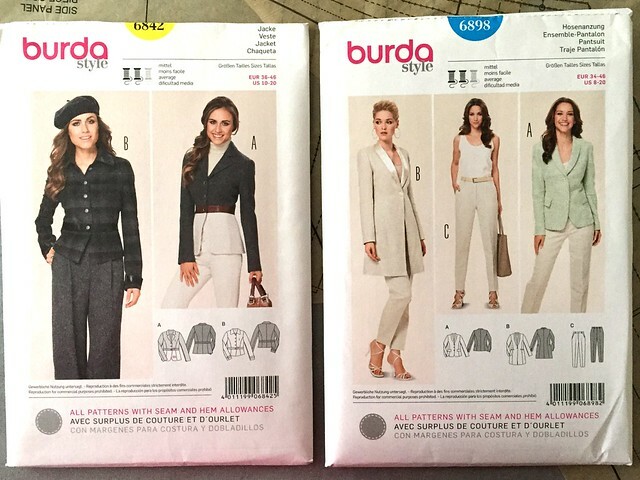 I think if you are in the size range (Burda European size 44-56) in particular if your bust measure fits in that range then these Burda patterns are really good. Both in the envelope patterns and the magazine/pdf patterns, there is just about any style and some really outstanding choices. I know there are some wacky ones - they always throw in a few zingers but they do that for any collection. Here is the pattern envelope. You still can't really see the design lines because they have also used a rather bold print. See? Slightly unusual with those two piece fronts, and then sleeves that are also also two pieces, and attach via a modified raglan seam. A better look at it on the dress form where those quasi-princess seams are more apparent. It probably doesn't show but the two piece sleeve seam is sewn last, so you sew the whole front and the sleeve front, then the back including the sleeve back, and then join front and back up the whole sleeve and shoulder seam. Clever, I thought. Also lots of adjustment possibilities, for bicep adjustment, take in or out the sleeve circumference, take up at the shoulder if needed. 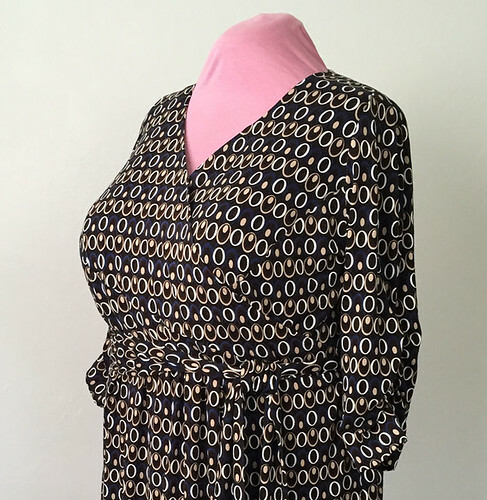 Heather mentioned that she liked long sleeves on this type of jersey wrap dress, and wanted to be able to push them up - but mentioned how she found it annoying that they never stay pushed up. I know just what she means. She said I wish they could be permanently scrunched up that way. So I had a tiny light bulb moment and did a bit of ruching with elastic at the bottom of the sleeve so they gather up and create that sleeve scrunched up look. I put a piece of paper behind the sleeve so you can see it a bit better. Also this fabric, at first I confess I didn't care for it but it did grow on me. The background is a burgundy-brown shade with cream, ivory and blue ovals. This fabric - aaaagh - reads like a stripe. Not the easiest to work with for a dress with curved pieces but I did the best I could. And told Heather no more buying fabric without sending me a text image! Ok only slightly kidding there but she bought another one that is a very specific directional pattern that I still can't decide what to do with. How about some pattern adjustments? Not all that many on this pattern, I used the size than corresponded to her measurements and for the most part it worked will. However - I think a V-neckline wrap is just never gonna cooperate with someone with, shall we say, an ample chest. Just a fact - that V-neckline wants to open and this is a business/office wear type of dress so a little adjustment was in order. 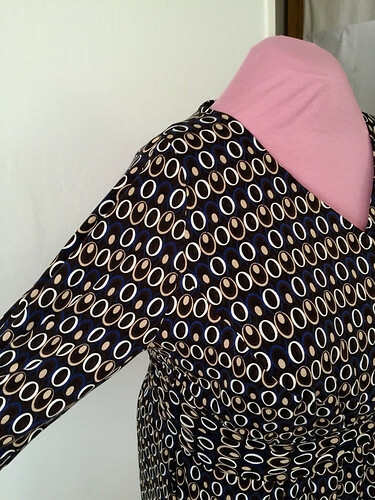 This is the upper bodice pattern piece and I did the adjustment that I very often do on wrap tops, which is to change the curve of the V-neckline to add at the center front. The center front line a front bodice piece that is a wrap is the guideline, and if you do a tissue fit or make a muslin be sure to draw in that line, and then pin the pattern pieces together there. See below, the Center Front is noted. I needed to raise it up about 1 inch at the center front, so I played around with the addition on the pattern piece to give a graceful curve on the two overlapping sections. It might look like a weird segment that was added but scroll back up and see that it brings the lowest part of the V to a perfectly daytime appropriate spot. I have done two posts on the Craftsy blog about adjusting V-necklines, this post is for a variety of adjustments including this type. This post talks about adding length to the front of a wrap bodice and also adjusting the center front curve. I did a full lining in the dress, using the knit fabric that I have used for a lot of knit dresses. I thought about leaving the lining off the sleeves, but with the raglan that seemed more trouble than it is worth and this way it gives a nicer finish on the inside. The lining takes the place of any neckline facings which I don't like. As you can see I made sure to turn and under stitch the neckline edge so the black is not at all visible. Having a lining in a knit dress makes it so easy to wear, and you can wear tights without any extra layers since the lining is more slippery. Every time I show this someone asks, the fabric I use for all knit linings is call Jet Set Knit , I buy it at Joann Fabrics and it doesn't cost much, comes in a lot of colors although I mostly use black, white or the ivory colors. And it washes and presses really easily. So not very fancy but it does the job. Also in the Dancewear section of the knits you can find some other knit fabrics that really are linings, like you would use in leotards or gymnastics/skating costumes, and I sometimes use those as well. This fabric is 100% poly but it doesn't feel clammy. I wouldn't use it in something designed for hot climates - although I used it in this dress and it is great. So maybe I would. The one thing that many might not like about this dress is that it is a faux-wrap, so their is a side zipper. The front sections actually cross all the way over and are attached into the side seams. So the only way to get in/out is to have the side seam zipper as the waist is fitted. Which made more work, with the lining etc. 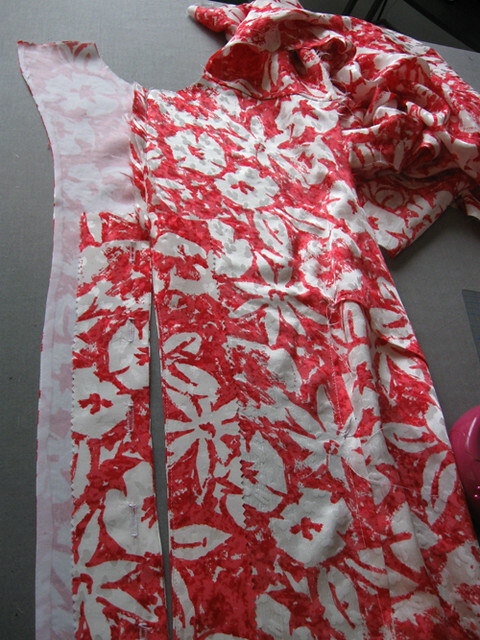 but gives such a nice shape to the final dress. Here is the zipper, you can't even see it :). Also considering the print and the various shaped pattern pieces I think I did an OK job on making the "sort-of" stripes of the oval print match. Since this is not really a wrap but a faux wrap, per request I put a snap at the center front just for insurance. 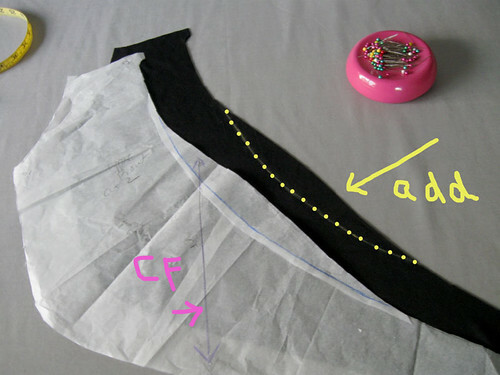 It is a bit tricky figuring out where to sew the snap parts so I have my method which might make no sense to anyone but I will show it anyway. I pin the dress wrap closed just as I want it to be. I do this all with long pins, then take it off (either the person or myself and mark with thread tracing. I mark the exact center front, and then diagonal lines where edges overlap. You can see where that knot in red thread is showing where the part underneath is in relation to the upper layer. It is keeping these angles in the same orientation that allows you to sew on the snap parts on the upper and under layer so that it lays nicely when the snap is done up. Another look at Heather in her dress. I think we will repeat this in the spring in the short sleeve version. And oh, that lawn is sad. Had to let it go for the most part due to the drought. and now it is growing a little bit in weeds and patchy bits. I confess - I bought some bulbs today, tulips and daffodils. Very late to put them in the ground but they will be OK. I just can't resist the colors! Hi all and Happy New Year! I am not one for introspection when it comes to what I sew, nor am I a planner in any way. It constantly fascinates me to see all the list making this time of year as to what will be sewn. That is so not how I operate. Whatever whim or new pattern comes my way is mostly what I sew, with a few basics or a general thought about some theme - such as needing to tackle pants, or wanting a certain color jacket to round out my wardrobe. I can say that the past few years I have not bought a lot of fabric at retail, whether in shops or online. Perhaps 50% of my fabric sewn is from things I bought as estate sales, sewing guild fabric sales or given to me. It is just so satisfying to rummage through the pieces of fabric and then take the challenge of whatever yardage length and then make it up into something I am thrilled to wear. The low investment generally increases the sewing satisfaction for my frugal side. In fact some of my best things have been sewn with fabric from this very category. Which brings me to my exciting end-of-year news. 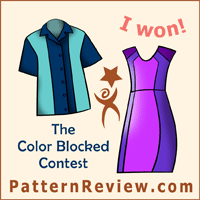 I won the Color Blocked Contest at Pattern Review. 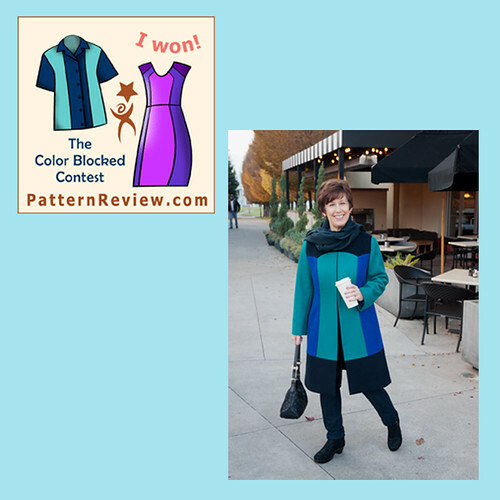 I'm so thrilled and Thank You to everyone who read my review and voted for my Tri-Color Coat. Here is the link to the post for this coat. The prize is a $ 100 gift certificate to Mood Fabrics so now I have to choose something special. 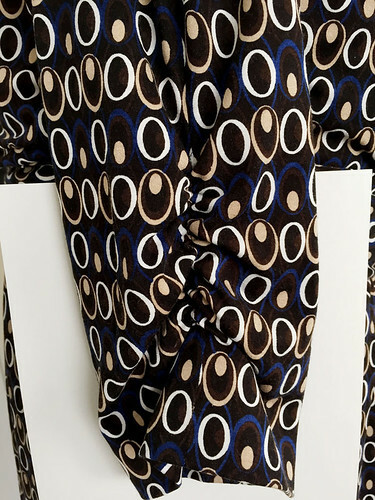 The first things that come to mind are the ever elusive pretty border print to make a special dress, or a substantial knit to make the perfect all-purpose travel blazer jacket that would look sharp and stand up to being scrunched in a travel bag. We shall see. Starting with items sewn in 2015, a total of 30 items sewn for me or a friend/family member. I think this is fewer than previous years, and that is probably a good thing. I spend a LOT of time sewing the previous year and this year realized there were a few things neglected (garden - partially due to drought, and gym time - partially due to laziness) as well as other things I just wanted to do with my time. Plus closet space is becoming non-existent. I have a lot of stuff - most of it dear to me and not ready to be parted with. So sewing new things becomes a bit silly. Also I surprised to see how many dresses I sewed - when I have so many already. I blame new pattern releases for the dresses - they look so pretty and fun to sew that I find at least one a season completely irresistible. As for pattern brands, not a lot of news there. 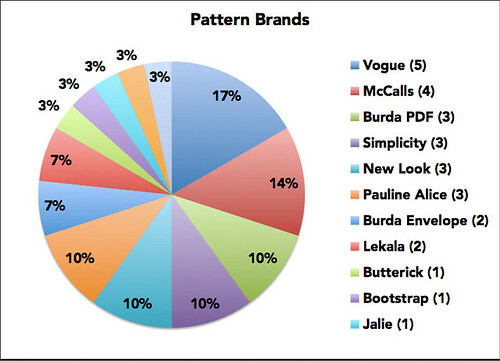 Well actually - Burda is tied with Vogue patterns if you count PDF magazine and envelope patterns. 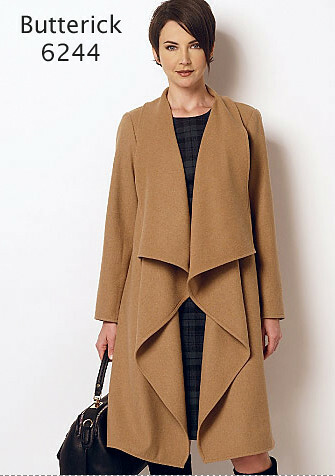 As a brand, Burda has really grown on me this past year and I think their coats are the best for all size ranges. I am still a fan of envelope patterns generally, and if a pattern has various items in the envelope, or variations on the item then I think even more highly of it. Such as a pattern with a jacket/skirt combo, or several variations on a top. I rarely buy a pattern that is just for one item. I think that is one reason why I rarely sew indie patterns as they are often just one item. This year I might try a few more. Another statistic that didn't merit a pie chart is Pattern Repeat: fully 50% of my items sewn were from patterns I have used previously. Which I think is a lot - and probably will hold steady next year. I just cut out a blouse this weekend from my trusty Simplicity shirt pattern (S2339 Amazing fit shirt pattern) which I have adjusted to have a hidden buttonhole placket (possible how-to if anyone is interested). Hidden buttonhole plackets are a secret weapon on a silk blouse where you are a bit afraid of the quality of machine stitched buttonholes - especially on silk - and who is not? Let's get down to the top 5 favorites of 2015. In no particular order. And I will add a number 6 favorite right here which is the Tri-Color coat, shown above. Which you might be sick of looking at now but I am not - pattern/fabric/color love and it is my absolute favorite thing I made all year! I have linked to each original post so there are more photos and some construction details on each item there. 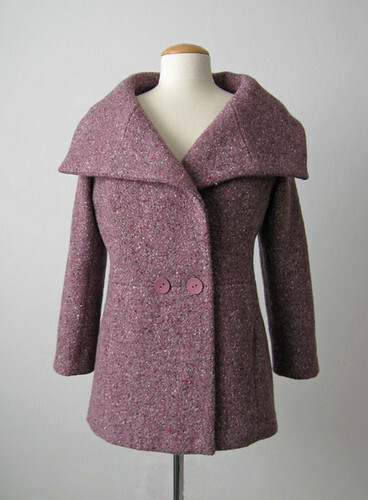 Plum wool shawl collar coat from Burda. I made this at the end of last winter and with our crazy climate wore it not at all. However once winter set in here I have worn it a LOT and it so warm and cozy. Because it is freezing here! At least to me. 42℉ in the morning as I was out shopping. Brrrr! for us Californians. In fact yesterday I was doing some early morning post-holiday shopping/exchanging and in two different shops the saleswomen said " love your jacket, so pretty" or some variation on that. You know how gratifying for strangers to compliment our sewing. Or at least they don't know it is home sewn :) And I cannot resist saying "thank you, I made it" After all why not? 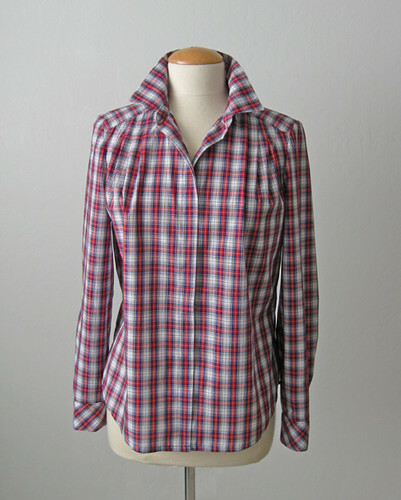 Burda 6840 envelope pattern plaid blouse. This was a pattern purchase whim and it turned out to be fantastic. 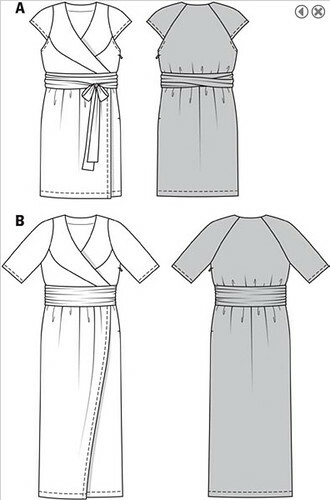 With a hidden buttonhole placket :) and options for a bow neckline blouse which I might try one of these days. Fabric bought at a garage sale, super soft and vintage cotton plaid which is a dream to wear and saw regular rotation last winter. Vogue 8904 the Shingle dress, a pattern repeat, this time in ponte knit. This pattern was a favorite the first time I made it but I knew it would be better in a slightly beefier knit. I saw this fabric at Stone Mountain and knew it was exactly how I had envisioned this originally. It is so nice to find the exact fabric that you have in mind and make up something that is just perfect. I wore this a ton in the summer/fall and it will be worn again a lot come next spring. 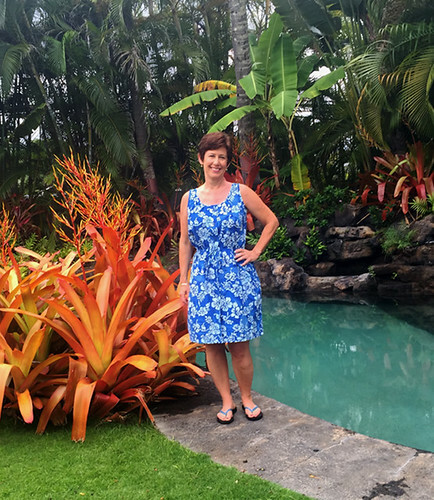 Next is another dress, made for wear on vacation, McCall's 6544 in blue cotton batik. You can't see in this photo but this is a vintage pattern from the 70's which has a lot of really cute details. And underscored my belief that a lot of modern patterns have simplified the construction so much that nice finishing details are lost, and the style suffers due to that. Anyway - I love the color of this fabric and will be wearing this again when the weather heats up. Another project where the fabric and style made a happy combination. 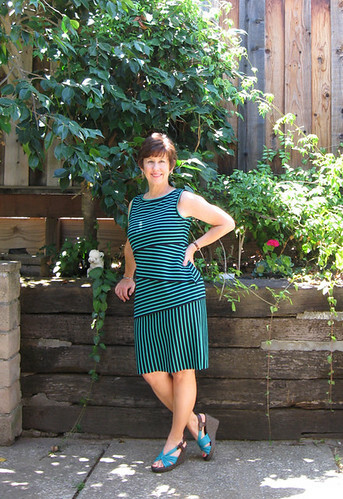 The Alameda dress from Pauline Alice patterns. I love this outfit and wore it as shown, with top and skirt, and then wore the skirt separately with a white top. 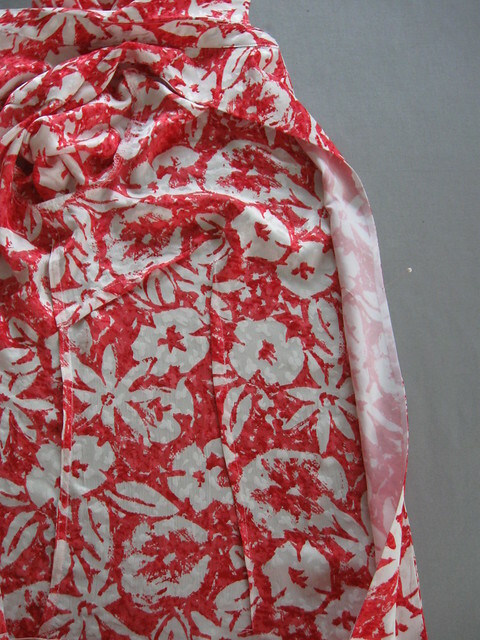 Very fun skirt to wear with the flounce, and pockets! I think this skirt will be a pattern repeat for the upcoming year, it is calling to me for a denim version. Pauline Alice makes really nice patterns, definitely my favorite of the independent pattern companies. This outfit uses another fabric I bought at Stone Mountain, not for a specific project but just because it was unusual and I liked the print. 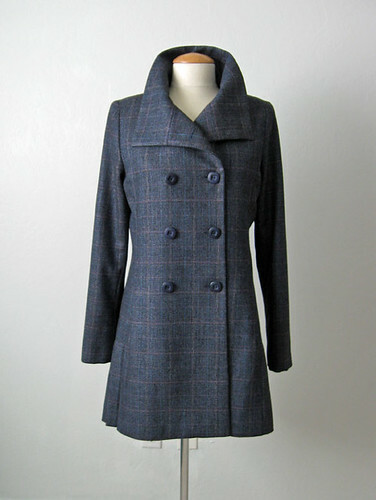 Honorable Mention: The Quart Coat, also from Pauline Alice Patterns that I made for my friend Jaime. More details and views on the post for this one. Another project where the choice of fabric I think made the garment really special. And caused many many minutes of checking and double checking when cutting and sewing. I do not recommend plaid for this coat unless you are really a wizard with plaid matching or enjoy tearing your hair out, ha ha. But in the end it worked out and I am so happy with it. So that is 2015, all done. 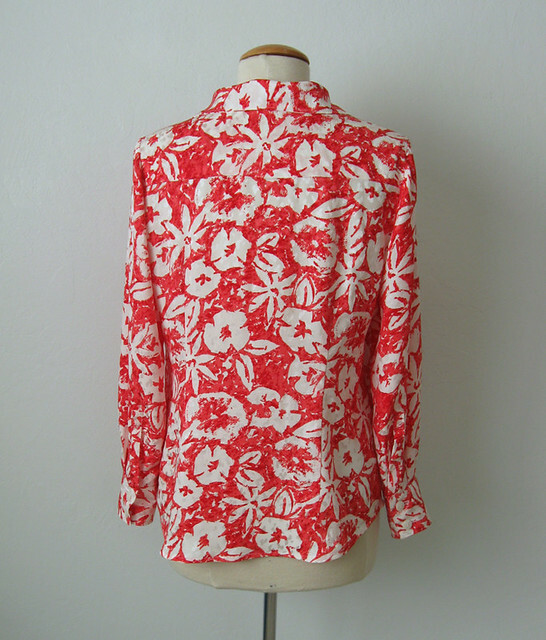 Up next, I am sewing a silk blouse and probably no more coats for quite a while :) Perhaps more pants in my future. Plus I am ordering some new rose bushes so I really should turn my attention outside. But it is so chilly out there and so warm in my sewing room! Thank you to everyone who reads and/or comments. I have said it the past few years but it always bears repeating, that meeting and getting to know other people who have a passion for sewing has been the very best part of writing a blog. It is so wonderful to have friends all around the world that share this interest and I know that while for the most part it is virtual but if we were to meet in person the feeling would be the same.